Virgin announces V6 4K TV box for January 2017 | What Hi-Fi? Virgin Media's new device is apparently 10 times faster than current boxes and supports 4K and (from next year) HDR content; the company has also revamped its apps, and announced a £300 'TellyTablet'. Virgin Media has announced the V6, its new 4K-ready television box that it teased in August. The V6 is apparently "10 times faster than current TiVo boxes", has a 1TB hard drive, and will take the fight to the Sky Q service. 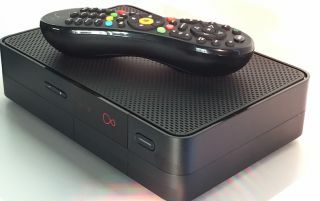 The device will allow users to record six programmes at a time, while watching a seventh recording or streaming content from Netflix, iPlayer, or YouTube, and can connect to other TiVo boxes in the home, so you can access your recordings on other devices. It's not yet HDR (High Dynamic Range) compatible, but a sofware update next year will add HDR functionality to the device. Virgin has also redesigned its remote to make it smaller, and given it extra functionality. There's a new search button, which "instantly fires up the TiVo brain" so you can get to your content faster. There have also been improvements made to the RF remote (it was previously infrared), so it will connect to the box if it is in a cupboard or concealed storage. And you can now press a button on the box to make the remote beep, to avoid you losing it down the back of the sofa. The Virgin TV Anywhere app has also been revamped, to work in conjunction with the V6. You'll be able to sync recordings to smartphones and tablets, or remotely set, cancel and delete recordings on the Virgin TV V6 box. Virgin is also starting a 'download-to-own' digital film store, which includes shows such as Game of Thrones, and in addition to being able to download the film, subscribers will also receive a DVD of the film or TV show through the post. A similar service is offered by Sky. As well as the V6 box, Virgin is also releasing the Virgin TV TellyTablet - an Android tablet with a 14in HD screen and four built-in speakers that Virgin wants you to watch television on. As such, it's given the TellyTablet an eight-hour battery life, 32GB of memory that can be extended with a Micro SD card, two USB ports, and wi-fi connectivity. There's also a new Virgin TV kids app launching in February, coming with 1,500 hours of children's on-demand content and a range of interactive games and picture books. The Virgin TV V6 box will cost new subscribers £100, and will be available from January 2017, while the TellyTablet will cost £300 and be available on the 1st December. New and existing Virgin TV subscribers with a top-tier Full House or VIP bundle will be offered the V6 box at a special discount rate of £50.